I enjoyed perusing the NMC Horizon Report, 2015 K-12 Edition (2015). I have two pages of notes on articles that I want to read and possibly use in my classroom. All of it was interesting, but I hadn’t found one that gave me that itch, the one that made me stop reading and start creating until I read the last few pages. Digital badges. Badges! So simple and yet so much deeper than I ever considered. After reading the section on badges, I immediately wandered through all the links provided, clicking on those links other links that caught my eye. I found a hashtag to follow on Twitter (#dmlbadges) that led me to new people to follow and a whole new community to join. The article led me to Mozilla Open Badges, which was interesting but very hard for me to understand and follow. 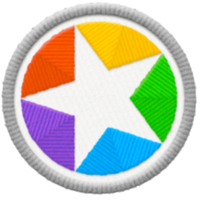 I researched how teachers are using badges in their classrooms and found Classbadges, a site geared toward educators interested in using badges to increase motivation, like digital stickers. This site led me to Mozilla Backpack, which allows uploads of badges from non-Mozilla sites so that everything is in one place. I can remember earning stickers in elementary school. The excitement of receiving a paper with a gold star was tremendous, a little lift in my day, and the satisfaction of having my hard work acknowledged. Last year teachers in my district had to complete three workshops to earn their Chromebooks. We earned a badge for each level we completed. Most of us printed our badges and displayed them on our doors. Why do educators stop handing out that tangible acknowledgement in high school? I collaborated with a 9th grade English teacher who handed out scratch and sniff stickers for perfect vocabulary tests. At first, the kids rolled their eyes. They were way too old for stickers. But by then end of the year, English binders were covered in them. And the binders were proudly displayed on their desks. I made a mental note to buy stickers and use them, but I never did. My first few days of school will be spent helping my students set up their Chromebooks for success in algebra. My site will be our jumping off point, allowing them to join our Google classroom, follow my classroom tweets and get my Remind texts. I decided to create badges for each of the assignments I want them to complete that first week. They will need to create an account on Mozilla Backpack, and then create an account on Classbadges. As they complete the assigned tasks, I will award badges that I created. Each student will receive an email when they earn a badge. 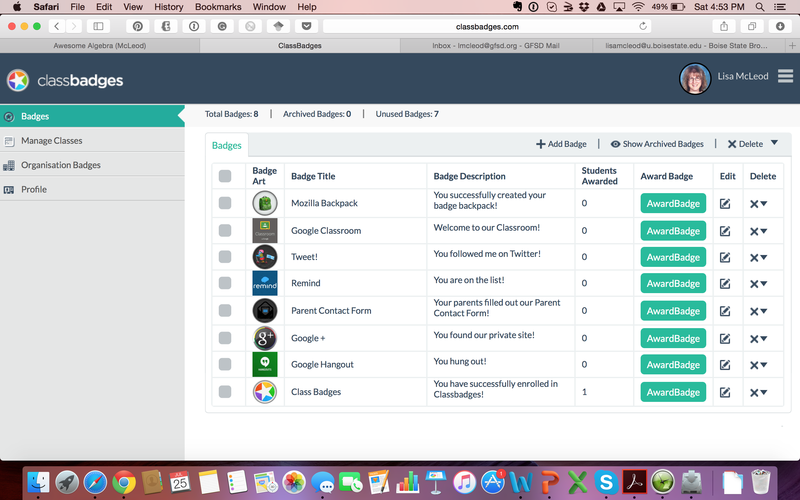 Once they log in to Classbadge, they will see the badge and can choose to share it. One of the options is to send it to their Mozilla backpack. This will keep all their badges in one place, much like the sash a girl scout wears to display the badges she has earned. Badges can also be printed. I plan to create a bulletin board called “The Fridge” where students can hang their work and badges if they choose. Once the first week is over, badges will be earned for mastery of standards. Last year I started exploring standards-based grading. I am looking for a more concrete picture of what my students have mastered and what they need to review. This will fit nicely into my vision of a flipped classroom, allowing me to differentiate my instruction to match my students’ needs. Each unit has a Mastery Tracking sheet containing the standards that make up the unit. As students demonstrate mastery of a standard, they will earn a badge. There will also be badges to show mastery of a unit. It will be simple to see who has earned a badge and who has not on my Classbadge dashboard, giving me another quick formative assessment method. While I am excited to try this in my classroom, I do have some concerns. The first is buy-in. Will my students be motivated enough by the badges to do the work to earn them? It appears that students who do not often receive acknowledgement for their work are most motivated by the badges. This fits the majority of my students, so I am hoping this holds true for my classes. Another concern is something that many sites refer to as local vs. global. While the badges have meaning within my classroom (local), there is no value to them once a student steps outside my room (global). Are local badges enough to motivate my students? I don’t have an answer to that yet. My last concern has to do with my choice of platform. Edmodo allows me to award badges for completed assignments. My school uses Google Classroom, which does not have this feature. After researching, I decided that for now I will not be using Edmodo. I don’t want to have students trying to find assignments on two different platforms. Classbadges and Mozilla Backpack seem less confusing. I will have to reflect and assess as I roll out the implementation and receive student feedback. I decided to put together a step-by-step guide to setting up and using Backpack and Classbadges to share with the faculty at my school. My hope is that other teachers will start using this technology so that it becomes more global than just my classroom. While still a local use of badges, it is a small step in the right direction. Edition. Austin, Texas: The New Media Consortium. This entry was posted in 1.1 Creating, 1.2 Using, 1.3 Assessing/Evaluating, 2.1 Creating, 3.1 Creating, 4.3 Reflection on Practice, Edtech 501 and tagged badge, Classbadges, digital badges, edtech501, Mozilla Backpack, Tech Trends.